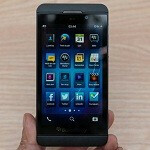 Bell and Telus to launch BlackBerry Z10 on February 5th? This rumor, if correct, would be a symbolic way for the iconic Canadian manufacturer to announce its rise from the depths with not only a stellar product announcement, but with firm carrier partner announcements and firm release dates with at least some of those carriers. We have seen rumors that the BlackBerry Z10 may launch as early as February 28th, which gives everyone a month to get ready and pre-order or whatever. Actually, we might see some lengthy lines at some of the stores for these devices. Now there is a rumor being floated that Canadian carriers Bell and Telus will be the first out of the gate with the BlackBerry Z10 on February 5th, the Tuesday following the official announcement on January 30th. That would be an impressive showing so soon after an announcement. amazing!! so happy! but so jealous that they's get it early!